Formed in Melbourne, Australia by 4ARM’s Danny Camilleri and Teramaze’s Dean Wells, the band is rounded out by bassist Nick Walker and major rhythmic weapon Jon Dette, of Iced Earth, Slayer and Testament fame, not to mention his gig as temporary replacement for an injured Charlie Benante in Anthrax. It is the combination of the embarrassment of riches—and richness of ideas—embedded in the songwriting team of Tombs and Wells, with the band’s warm and yet locked-down rhythmic beds that conspire to make tracks like groovy thrasher “Chronicle of the Dead” and conversely the textured and proggy “At the Edge of the World” so easy-drinking and yet thought-provoking of detail. Thrash drumming legend Jon Dette took some time to chat with us on the recent promotional tour for the release of the album. First of all, wanted to start by saying congratulations on the new album, Alliance of Thieves. Absolutely fantastic. It has the typical thrash influences there, but with a modern twist. What about the album cover itself? Is it linked to a particular track, or how did that come about? I don’t think it was specified for a particular track. It’s actually, that was something that Danny [Camilleri] had worked on with an artist, and that was his conceptual idea, design. Danny is also a tattoo artist in Australia. He’s more of the artistic one as far as drawing and things like that. Whatever it was, it was something that was a reflection of whatever he had in mind that would be great for this Meshiaak record. It’s not for any particular song. Danny might have a different answer, put as far as I’m aware, it doesn’t have a particular meaning for a song. The press release uses the term “supergroup.” I just wondered how that term rests with you personally, or is it typical PR and just doing their job? That’s a good question. I don’t know how it got coined that in the first place. I know that Danny was in a band, 4Arm, and Dean currently has another band called Teramaze. I think maybe because those bands do fairly well in their home country that maybe that’s where the phrase got coined, as a supergroup, because of the involvement of them and their bands. Then obviously me, with the bands that I’ve worked with. Me personally, I don’t look at it as a supergroup. Meshiaak is a band, and it’s not a project, it’s not a collaboration, it’s a band. We’re all core members, and we’re just four guys that are trying to make great music that we really enjoy playing, and we hope that everyone else will enjoy it as well. How did you come to hook up with the other guys? 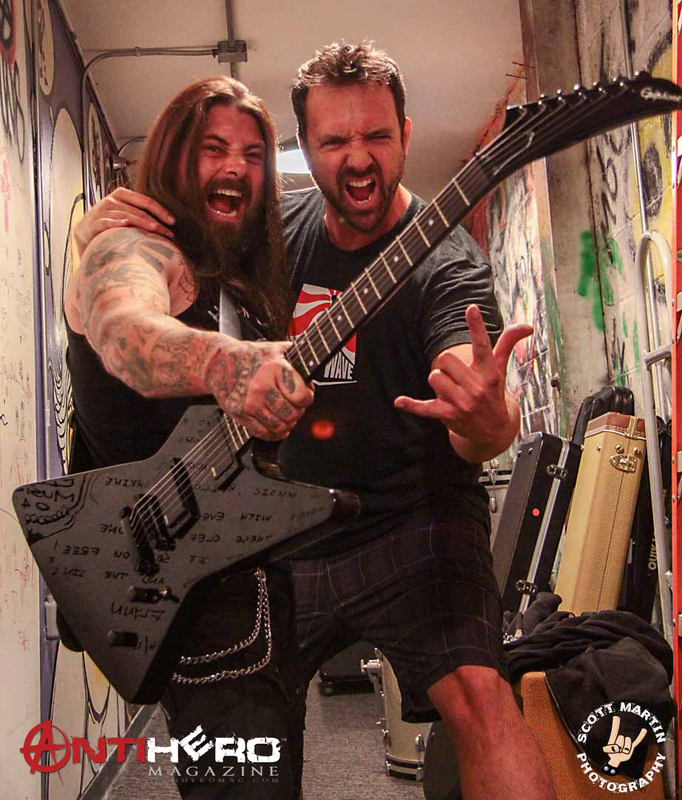 It started with a gentleman by the name of Chris Merrick, who I was introduced to in Australia back in 2013, when I was performing with Slayer and Anthrax at the Soundwave Festival in Australia. Chris was a publicist for Soundwave, and he’s also a friend of Danny’s. After I had the chance to meet Chris during that tour, about six months later, Chris contacted me, and told me that Danny had this new band going on, and was trying to put a band together, and really wanted me to be involved with it. At first I was reluctant, because of the distance. It’s not like you just jump in the car and be right over. I think Australia, for me … I’m in San Diego, California, so Australia is almost as far away as you can get, for trying to have a band. Additionally, I had just passed on the idea. I did eventually speak to Danny. He was a really cool guy, and then we had a great conversation on the phone, and I said, okay, why don’t you send over some demos, let me check it out. They were all really rough ideas, with rough drum ideas and stuff like that, but the one song that really stood out for me was Alliance of Thieves. That was the first song I had ever heard demos from, with the band, and in particular, what stood out for me was the very ending of Alliance of Thieves, where Danny actually uses a singing voice and sings. That really caught my attention, because I was like, wow, this guy has a versatility and a range to him. In my mind, completely opened more of, this being just a band with some screaming vocals to a band that really could explore a lot of new territory. Going back to your original question, we were introduced by Chris Merrick, and that’s how the initial talks started. The long story short is that is eventually worked out to where I signed on, and I was originally just going to do the album, because I hadn’t met Dean, I hadn’t met Nick. You don’t really say you’re going to join a band, at least in my mind, you’re not going to join a band without at least meeting the guys, playing some songs together to see how it feels. 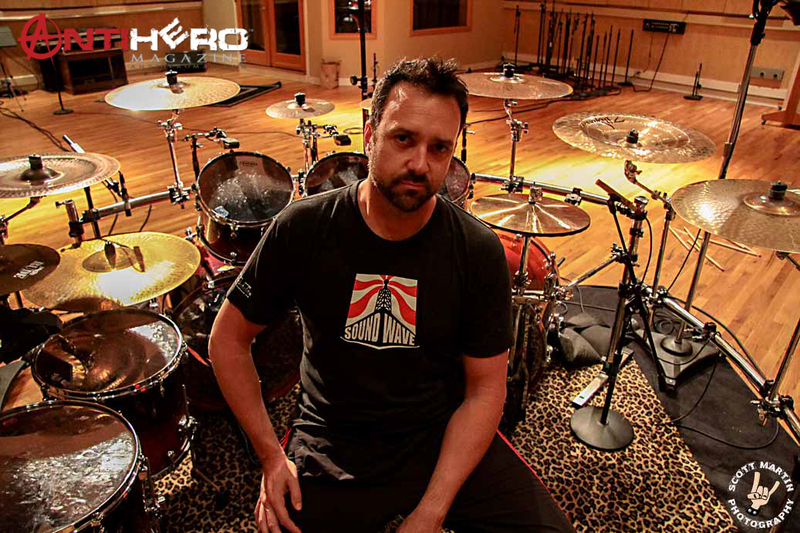 I originally signed on to do the album only, but the guys felt so strongly about my involvement, which is really awesome, they all flew from Australia to California to be involved with the drum tracking process and pre-production, which I thought was really, really cool. At the time, it didn’t seem necessary, but I’m so glad that it happened that way, because, as I say, we all went into the studio to make a record, and we came out of that studio as a band. During that process was where, 1, musically, the songs just came to life once the drums started building on these arrangements, and 2, we all had a chance to actually hang out and bond, and discover that yeah, we all enjoy the same things and all get along great, and I felt like I just immediately made 3 new friends for life. It was a really great experience, creating the drums and tracking the drums, those 2 and a half weeks that we had. That’s really where Meshiaak, in my mind, was truly born, because when we left that studio in Oakland, at that point that’s when we were officially a band. What about the name itself? Is it an actual word, or is it something that has been invented by you guys? Meshiaak means “Messiah” in Hebrew. I don’t know, the name Messiah just seems too … It just seems like if you call a band Messiah, I’ve heard that name used before or whatever. Give it a twist on it, the first time that Danny … Danny came up with the name, but the way. The first time he said it to me, I said, what the hell is that? He said “Well, it’s Messiah in Hebrew,” and after I said it a couple of times, and I asked him, am I saying this correctly? I think it really adds to the uniqueness of the band. It’s one of those names that initially, I think we’ll have to educate people to a certain degree, to know how to say the name properly and all of that, but I think once people get it, it’s one of those names that they won’t forget, and it really stands out. It adds a uniqueness to it that I really enjoyed about the name. You’ve highlighted the Alliance of Thieves track from your album. Just wondered if you’d maybe pick another one that stands out for you, that has a particular memory, maybe of songwriting, perhaps, or recording process? Is there anything else you can maybe pick off the album? They all have a story in and of itself. It’s funny, there’s actually, there’s a song called “I Am Among You,” which is the second or third track on the record. Actually, it’s the third one of the album. I’ve actually been fortunate enough to hear the album, it’s track 3. Yeah, that’s the single, isn’t it? It’s not so much the single, but it was the first song that we actually released as a video, but it’s the first track as well, tracking drums in Oakland. That was the first song that I had actually tracked on the record, because it was the song that I gravitated towards the most. Overall, it’s a fun, great song, and then, like I said, every song has something to it on the record, but in particular, those three tracks would stand out as being memorable, that I can remember. Your drumming CV is certainly very impressive. There’s lots of familiar names there to myself, from the thrash musical genre. One thing that’s actually surprising me on there was your movie score that you did with Stewart Copeland. I just wondered, bearing that in mind, if there are any other musical genres, outside what you do with the metal/rock that you would consider working with, something different? Well, I’ll always look at something new and unique. That Stewart Copeland thing, it happened so last minute, and I had to do it, just because Stewart Copeland’s one of my all-time drum idols. It’s funny, we were talking high-hat work. I mean, Stewart Copeland’s high-hat work in particular, to this day, is just … I listen to songs from The Police, and just go, “man!” It’s just the thing that he does is incredible. With that, or if he was doing a country song, you know what I mean? Just the fact that it was him and he asked for me to work with him on a composure, how do you say no to that? I don’t know. Really, it would depend on the artist and the project. I’m never going to say no to anything. People crack jokes sometimes, they’ll say, guys, what would it be like to see you play, you know, for Lady Gaga, or Madonna. I could see it. I would never rule something like that it out. It wouldn’t be because of a sellout, it’s just because it would be adding a job and an outlet for something that would be compatible. It’s a different challenge, isn’t it? It would definitely be a different challenge, and step out of my comfort zone. At the end of the day, I wouldn’t try and necessarily play a different style. I am what I am. I’ve said this before, I’m not a country drummer, I’m not a blues drummer, I’m not a jazz drummer, I’m a heavy metal drummer. That’s not to say that I won’t explore out of that realm, but that’s what I am, and that’s what I enjoy playing. Anything else I’m going to do, including the Stewart Copeland stuff, it’s going to be my style drums. It’ll diversify a little bit, for whatever the situation is, but at the end of the day, that element is always going to be present. I don’t think I could ever tap into something and just start playing some shuffle beat with a single kick. I could, but I don’t want to. Returning to Meshiaak, you said it’s going to be a band, rather than a one-off musical project. I just wondered, obviously those songs deserve to be played for a live audience. I just wondered if you have maybe tour dates lined up? We’re working on that at the moment. Right now, we’re looking to try and get on the road either at the end of this year or beginning of next year. We’re currently looking at several different tours that we can try and be a part of, with the focus being that Meshiaak would go out as a support band for a larger artist. We’re currently looking at some tour packages that are being presented to us right now, and see which ones will work and which ones are going to be most appropriate for us. Absolutely, you can certainly expect to see Meshiaak out on the road, probably by the end of 2016 or early 2017. That will either be in the States or Europe first, I would assume. Certainly Australia, Japan, South America would all be included in that at some point next year. Thank you very much for chatting to me. Congratulations on the album again. It’ll actually be out in a couple of days’ time, hopefully you’ll get over to the UK to do some dates over here. Absolutely. Yeah, the UK will always be a part of the Europe tour plan. I would expect that if we plan a European tour that the UK, which would include Ireland and Scotland as well, would definitely be on that tour. Okay, that’s great, Jon. Thank you very much for chatting to me.